Dali Spektor 2 5.1 is an easy-to-accommodate package made up of four Spektor 2 speakers, Spektor Vokal and C-8D Sub delivering best-in-class detailed and entertaining sound. Dali Spektor 2 5.1 Speaker Package delivers a fast, detailed and entertaining listening experience, hard to beat for the value. This quality package features two pairs of the back-to-back award-winning Spektor 2 bookshelf speakers, Spektor Vokal centre speaker and the C-8D subwoofer. The surround of the 8” down-firing woofer is built to allow long and linear excursion. The integrated 170 Watt RMS Class D amplifier enables the Dali Sub C-8 D to follow and render the required signal with an absolute minimum of bias. Dali Sub C-8 D has been engineered to perform equally well on both music and movies. 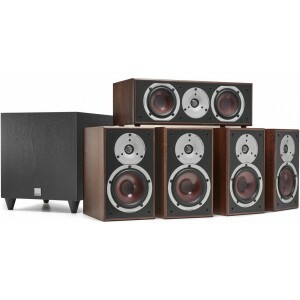 For more information on the bookshelf speakers, visit our main Spektor 2 page. For more information on the centre speaker, visit our main Spektor Vokal page. For more information on the subwoofer, visit our main Sub C-8D page.